Along with coffee, the consumption of tea is regarded as a highly social activity. It is said that tea originates from the Chinese Shang dynasty and was used for its medicinal qualities. During the 17th Century, tea became highly popular in Britain and further promoted to countries like India. 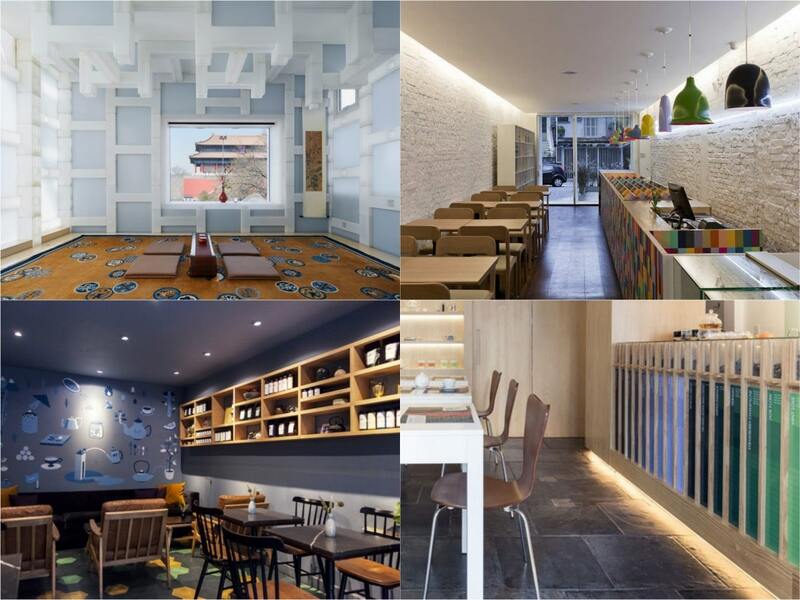 Here, we present a selection of interiors that offer both a traditional and modern appeal on tea culture now. Using large wooden letters that spell out tea in Spanish, the entrance to this tea café in the Brazilian city of Porto Alegre influences the interior too. The large E becomes part of the main tea preparation counter, whilst the T frames the main door. Inside, a stone slab floor plays contrast against a largely wood interior. 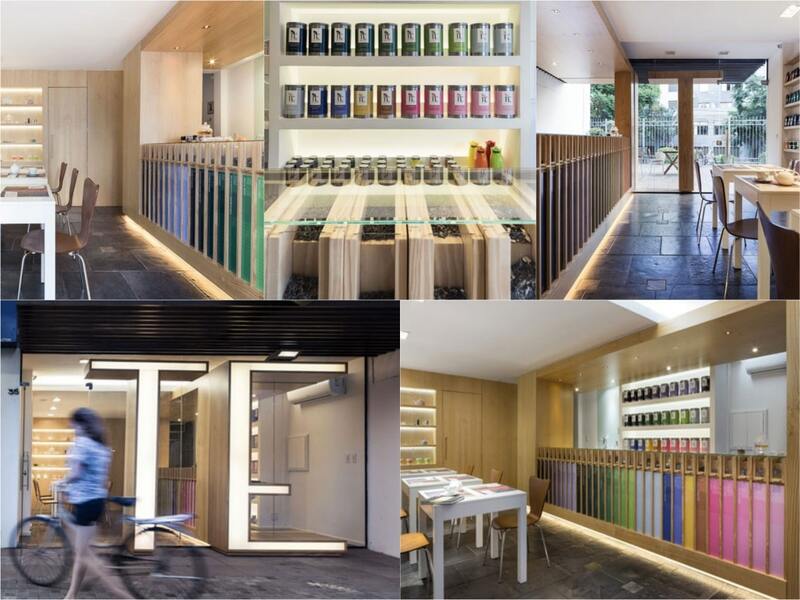 From the walls to ceiling and furniture, the space is a combination of a modern tea café with light wooden tones and a colourful display of tea vessels. The use of colour adds an attractive accent wall feature whilst also creating a way finder for the many types of tea on offer. Another space that uses the main product as a focal inspiration is at the Gourmet Tea café. The long and narrow shape of the building has meant the internal space must enhance this challenge as an opportunity. A simple and practical solution was sought and quickly allowed the new occupants to transform the space. Bare brick walls have been given a fresh white pain finish to brighten up the long lengthy inside, while lighting has been added through a lowered ceiling creating a warm atmospheric feel. Plywood furniture sits along one side of the wall with simple wooden folding chairs. These add to the clutter-free and spacious interior created, whilst on the opposite side, the highlight is the long wooden tea display, counter and cash desk. 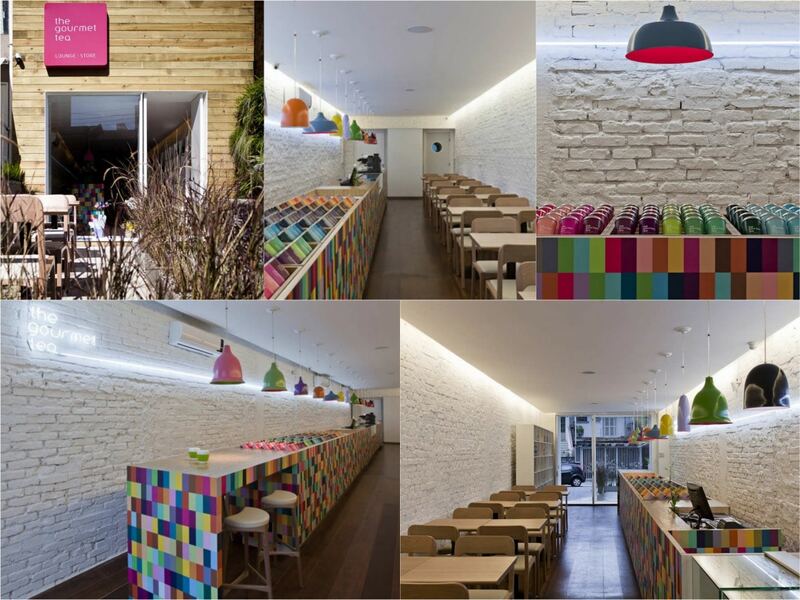 A single unit, the bright colours add vibrant feel to this minimalist tea shop and café. Dark sophisticated tones and a very classical modern style, this tea café is characterised by a strong brand identity and through experience of tea brewing. 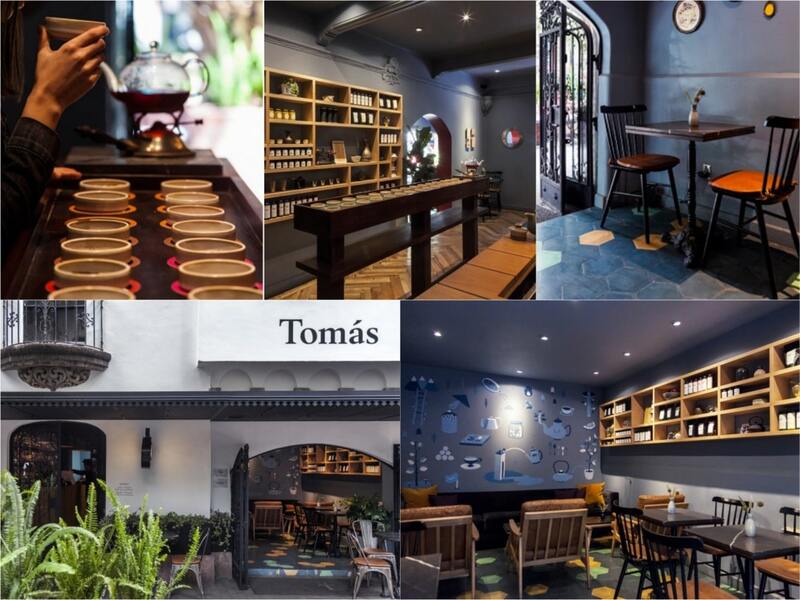 Named after a figure in tea history, New York-based tea merchant Thomas Sullivan, Tomàs Tea House is laid out in to specific areas. The main space is where tea can be selected, prepared and also ready-made tea bags can be purchased. Inside, a further space is offers the main seating area with a combination of wooden chairs and relaxed loungers. Above on the wall, hand-painted illustrations portray the birth concept of tea, from production to consumption. The key highlight is the level of comfort that has been created as customers enjoy tea in a relaxed and casual setting with both vintage and modern elements. 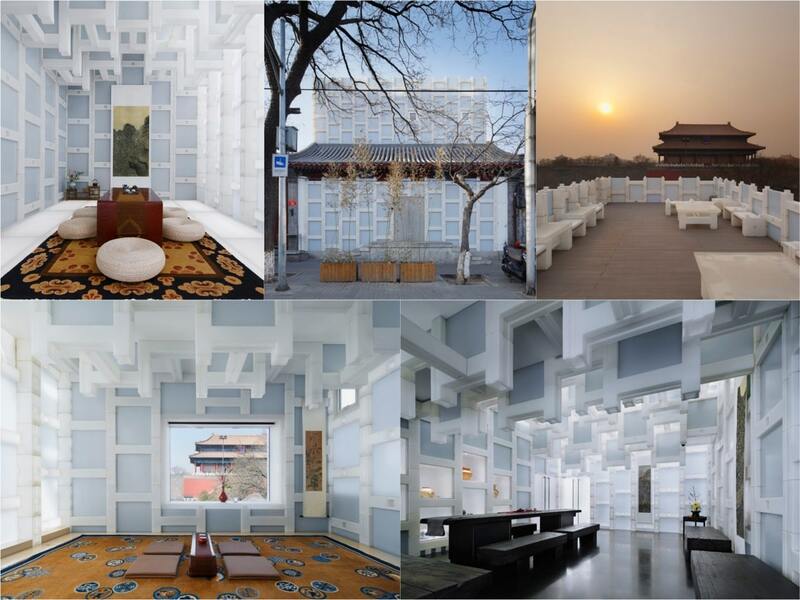 Combining traditions with modern architecture, this tea house, is situated on the east gate of the palace within the Forbidden City. Translucent hollow blocks of polyethylene have been used throughout the structure to further enhance heat insulation and at the same time for allowing light to flow through. The blocks add geometric elements into the space, whilst the furnishings have been kept highly traditional. Traditional carpets adorn the floor of the private tea rooms, which also feature original floor based seating mats and a low table used in tea ceremonies. The main communal room features black stained wooden bench seating adding a stark contrast against the white polyethylene blocks.